* The sweet plum recedes and saffron comes into the forefront with the oud for a little while. Then on me, I suddenly get Ivory Soap (on top of the oud). I am not sure exactly of the notes – kind of sweet, but in an inedible kind of way. * In the base, there is still the oud and saffron in the forefront. On different wearings, I’ve also smelled patchouli and a light musk – but it’s still all about the oud and saffron. Summary: Bond No 9 is what I call, lovingly, a battery acid fragrance. Once it goes on, it cuts through everything and takes control. I wouldn’t say it’s linear (meaning the same from top to base) but it’s linear-ish, as if the main oud and saffron stay in the game with different players joining for a bried inning/appearance. This is definitely not an office fragrance – save it for the nighttime. If you find New York Oud too strong and want to stay in the Bond No 9 line, try their Signature Oud in the gold bottle. Bond No 9 Royal Oud is available from Saks Fifth Avenue and Bond No 9 New York Boutiques. Oud and plum? I think I might actually like that! I’ll need to watch for this on my next sniffing trip. 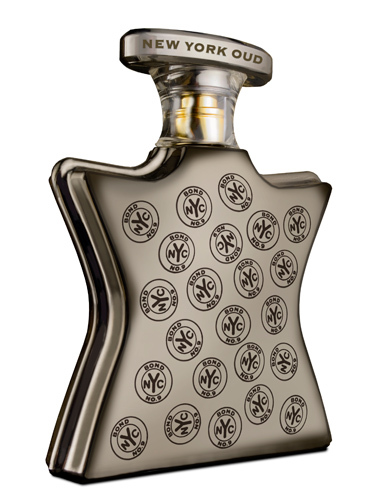 If you like “in your face” oud – then you will like New York Oud. I have almost bought it a few times – but realized that I already have several strong ouds so it is kind of duplicitous. Check out also By Kilian Rose Oud and Byredo Oud Immortelle. You know, I’m unsure how I feel about oud. I don’t dislike it, I’m not sick of it (b/c though I have smelled lot of the ouds that have come out recently, I haven’t bought any of them), but neither am I especially drawn to it. So I think in your face would be okay with me, because paired with plum. That just sounds good! I have almost bought a full bottle so many times.. only thing holding me back is price. I think when I sell off a few bottles – this will be my next treat for reaching a big goal. It really is one of hte best Bonds. I haven’t played with the Montale Ouds too much. I visited the store in Paris two years ago and it was just a bit overwhelming. You kinda have to question a company that puts out THAT many scents. The only one I’ve really played with is Chocolate Greedy which I really liked.